Koray Ozgen designed the visual identity and scenography of the “Istanbul Contrast” exhibition which took place within in the framework of the Turkish Cultural Season in France. Located at “Hall des Maréchaux” of the Musée des Arts Décoratifs, the scenography of the exhibition had a prior engagement to respect the historical and prestigious nature of the setting. 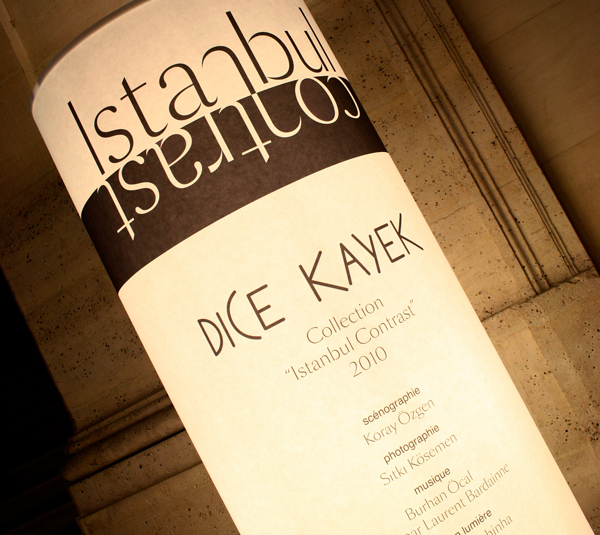 The scenography made a basic use of paper and light to put on stage the collection of the fashion designers Dice Kayek inspired by the multiple facets of the city of Istanbul. 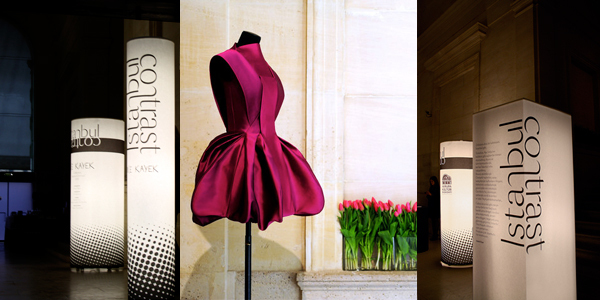 The major elements of the scenography were lighted walls enlighting Istanbul themed photographs by S. Kösemen, podiums upon which dressmaker forms and digital information panels were installed, lighted columns carrying the exhibition information and special lighting effects. Rose flavoured lokoums were served to guests and fresh tulip decorations installed to reinforce the multi-sensorial effect along with background tunes from Burhan Öcal.